Product categories of Marine Float, we are specialized manufacturers from China, Rubber Water Hose, Flexible Rubber Hose suppliers/factory, wholesale high-quality products of Steel Marine Floating R & D and manufacturing, we have the perfect after-sales service and technical support. Look forward to your cooperation! Polyethylene floater excellent toughness linear medium density polyethylene resin as raw materials, combined with corrosion-resistant, anti-aging and other materials, after Rotational molding, filled with high-strength polyurethane foam blowing process to produce the product, reasonable structure, excellent performance. As the water floating material mud tubes become traditional Steel Pontoon alternative products, also add UV resin material, rich enough toughness, hardness to withstand natural environmental changes and low invasion, will not pollute the water, and recyclable recycling , forming a seamless whole floating body. The hull of MDPE floater is made from medium density polyethylene of excellent flexibility, filled with high strength polyurethane foam inside. With reasonable structure and good performance, the MDPE floater becomes the best substitution of the traditional steel floater for the Floating Dredging Pipe. It is widely used as floater in offshore dredging working and oil area. The floating body is equipped with shock and wave resistance, compact and reasonable structure, easy installation and excellent performance. Being floating materials for mud delivery pipeline on water, it becomes the first choice of dredging customers. Good Toughness, strong environmental stress cracking resistance, and being appropriate for offshore and lake construction. Easy, fast and flexible assembling diversified modeling. Low price and cost performance is significantly better than that of steel buoy. 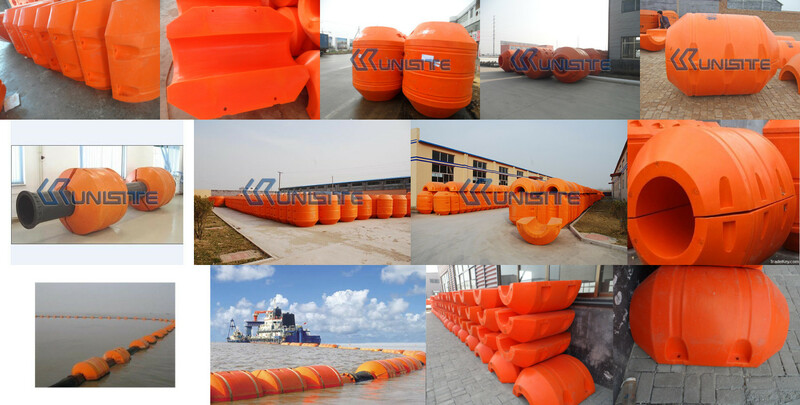 1, anti-wave impact of the floating body, compact structure, easy installation, excellent performance, as water pipelines floating mud material become lost customers preferred product of sediment discharge. 2, toughness, resistance to environmental stress cracking resistance, suitable for the construction of sea and lake. 3, light weight, wear resistance, ease of installation and handling, low transportation costs transfer. 4, corrosion resistance, weather resistance, long life, is three times that of steel pontoon life. 5, the assembly is simple, fast, flexible, shape and diverse. 6, low price, the price was better than steel buoys. 7, because of stable quality, innovative design, reasonable price and good service, welcomed by users. Use polyethylene float: mainly used in ocean, salt, fish farming, underwater oil, dredging duct laying. a, to ensure the delivery line of water float. b, orange exterior color can be used as warning signs to prevent the strike line. c, convenient transportation pipeline inspection and maintenance. d, shorten the construction period, reduce costs, reduce maintenance costs.